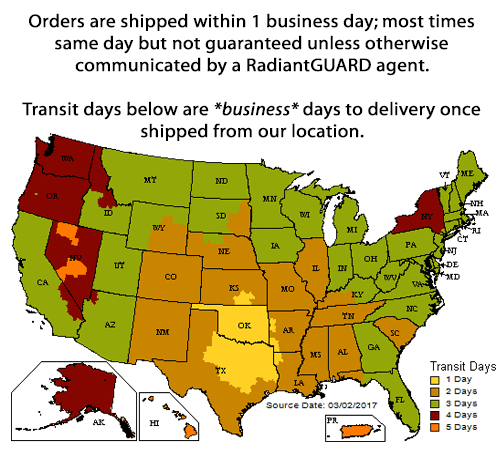 RadiantGUARD® radiant barrier foil and reflective insulation products are beneficial in ANY application where the goal is to CONTROL HEAT. When placed between a source of heat and an area you wish to keep cool, the surface of our radiant barrier material reflects 97% of the radiant heat energy back towards the heat source keeping the intended area cooler. That's a significant amount of protection against unwanted heat gain in the summer and unwanted heat loss in the winter and results in lowered monthly utility bills. Overtime, these monetary savings add up and continue to provide energy savings for years to come. On top of that, the addition of a radiant barrier foil insulation to your home or commercial building increases its marketability should you decide to sell in the future. Either way, you win by using reflective products in your residential home or commercial building. To learn how radiant barriers work, view our video. For help selecting a product, view our selection guide. To read what what others think, view our Customer Reviews. While researching competitive reflective insulation products in the marketplace, you'll most definitely discover conflicting information, some intentionally and some unknowingly reported, which causes confusion when trying to make a purchasing decision. We strive to provide consumers with unbiased honest information. Please review the extensive amount of information we've made available on our website and /or contact us with any questions you may have about our products or competitors claims. With a quick understanding of a few physics concepts, you can learn to easily understand how reflective insulation products work and identify some of the wild claims many competitors make about competing products. A majority of unwanted heat in a home during the summer comes from the ceiling above as a result of energy heat transfer from the attic space. The shingles on a roof absorb the radiant heat from the sun, and then transfer this heat (via conduction) into the attic space below. This heat is then radiated from the roof decking into the attic space, and subsequently into your living space below resulting in increased temperatures and added strain on your air conditioning units struggling to maintain a comfortable and consistent temperature. While most homes have one of many different types of conventional home insulation on their attic floor to help control heat transfer into the living spaces below (mass insulation like fiberglass, cellulose, or rockwool), the use of conventional home insulation alone cannot stop the transfer of this heat into living spaces. Conventional home insulation is designed to absorb heat (imagine a sponge) up to a certain amount based on its thickness (indicated by its R-Value). Once this mass insulation reaches its holding capacity (saturation), the heat is then transferred completely through into the living areas below. Our RadiantGUARD® attic foil insulation products BLOCKS 97% of unintended heat transfer when placed between the roofing material above and the living spaces below; much more than conventional home insulation alone. our breathable attic foil is the perfect addition to your current home insulation and can significantly improve the comfort of your home, reduce strain on your AC unit and lower your monthly utility bills. And with the cost of our DIY radiant barrier foil around $.13 per square foot, you'll experience a quick return-on-investment (ROI). Winter will be here before you know it and that means you need to be prepared for snow and ice and the potentially damaging effects it can have on your residential home. While the visual effects of an ice dam are undeniably beautiful, the physical effects to your roofing system can be extremely damaging to a roof, gutters, paint, drywall, and your underlying framing structure. This damage can also eventually lead to the growth of dangerous molds.